TWO SOLUTIONS IN ONE: You can use this product as a Bobber Hand Grip or as a Telescopic Pole. The locking system allows you to adjust the pole length anywhere between 6.7″ and 15.7″. The transparent material makes it seemingly disappear in photos. Ideal for capturing water sports activities! FLOATS IN WATER: When you drop this bobber/pole into the water, it will float. Its bright color will make it easy to spot. Alternatively you can add water to the hand grip compartment, so the bobber can achieve neutral buoyancy underwater. STORAGE COMPARTMENT: The cap on the bottom of the bobber can be unscrewed to reveal a hollow compartment that can be used to add water (to achieve neutral buoyancy underwater) or store small items. You can use this product as a Bobber Hand Grip or as a Telescopic Pole. The locking system allows you to adjust the length anywhere between 6.7″ and 15.7″. The transparent material makes it seemingly disappear in photos. 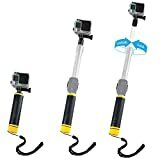 Ideal for capturing water sports activities! When you drop this bobber/pole into the water, it will float. Its bright color will make it easy to spot. Alternatively you can add water to the hand grip compartment, so the bobber can achieve neutral buoyancy underwater. The cap on the bottom of the bobber can be unscrewed to reveal a hollow compartment that can be used to add water (to achieve neutral buoyancy underwater) or store small items. This Waterproof Bobber Pole features a Detachable Cradle for your GoPro WiFi remote (WiFi remote not included).